How do I select a style? Selecting a style is a matter of personal preference. Look through our gallery to see examples of the different styles we offer to get inspiration. We also offer FREE design support. How do I pick the colors for my DigiPix Pop Art? 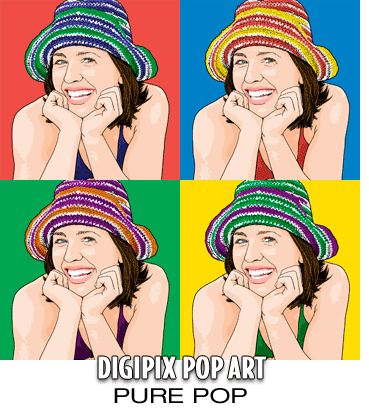 We have several color pallettes you can choose from when you order your DigiPix Pop artwork. Use our sampler (below) to view the color pallet choices. If you aren't sure about which color pallette would work best for you let us know and we can help you out and make some suggestions. Roll your cursor over the swatches on the right to view DigiPix Pop color variations. Can I choose custom colors?